ANTABUSE TREATMENT FOR ALCOHOLISM: AN EVIDENCE-BASED HANDBOOK FOR MEDICAL AND NON-MEDICAL CLINICIANS. Why supervised disulfiram is more effective than other drugs for alcoholism and how to integrate it with psycho-social interventions to achieve lasting abstinence or controlled drinking. Authors: Colin Brewer and Emmanuel Streel. Product Dimensions: 14 x 1.6 x 21.6 cm - i.e. pocket sized. OLITA Fig 4. 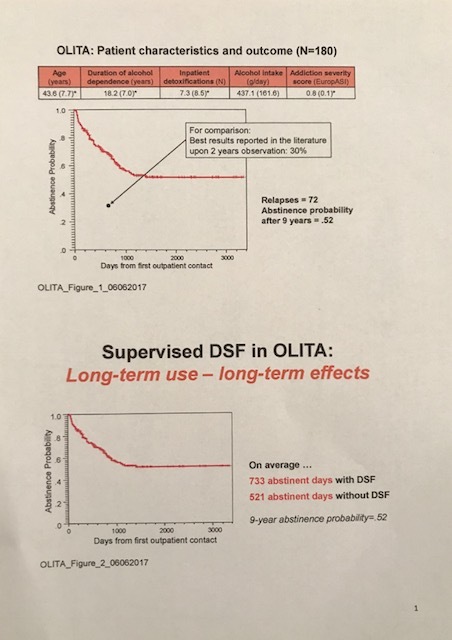 >20 months on DSF gets better results than 11-20 months. OLITA Fig 6. Decline in depression and anxiety scores over two years.